President Donald Trump is rejecting calls to cut off arms sales to Saudi Arabia following the disappearance and probable murder of the Saudi-born Washington Post journalist Jamal Khashoggi. President Donald Trump is rejecting calls to cut off arms sales to Saudi Arabia following the disappearance and probable murder of the Saudi-born Washington Post journalist Jamal Khashoggi. The Washington Post is reporting the Turkish government told U.S. officials it has audio and video evidence that Khashoggi was killed last week inside the Saudi Consulate in Istanbul. Officials say the recordings confirm that a Saudi security team detained Khashoggi after he walked into the consulate on October 2, before killing him and dismembering his body. Ro Khanna, Democratic congressmember from California is interviewed. He is calling for congressional hearings into Khashoggi’s disappearance. Khanna has been a leading critic of U.S. support for the Saudi-led war in Yemen. Facebook and Google recently admitted major privacy breaches. Facebook says the personal information of nearly 50 million users were exposed after an online attack. Meanwhile, Google is shutting down its social network Google Plus after revelations of a data breach that exposed the private data of hundreds of thousands of users. The breach was discovered in March but was not disclosed to the public. 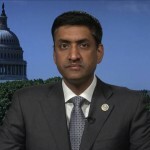 Ro Khanna is interviewed, who recently introduced an Internet Bill of Rights. Johns Hopkins University has announced plans to name a new research building after Henrietta Lacks, an African-American woman who permanently changed modern medicine nearly 70 years ago when it was discovered that her cells could live forever. These “immortal cells” have helped scientists produce remedies for numerous diseases, including the first polio vaccine, that have saved hundreds of thousands of lives. But Lacks’s cells were taken without her consent when she was a patient at Johns Hopkins University Hospital in 1951. For decades, the woman whose cells would transform modern medicine was unknown. Instead, her cells were simply known as “HeLa”—the first two letters of Henrietta Lacks’s first and last name. Rebecca Skloot is interviewed, author of the best-selling book “The Immortal Life of Henrietta Lacks,”. Jeri Lacks Whye is the granddaughter of Henrietta Lacks.